Beach Bungalow is a very large well-maintained bungalow in secure grounds, with off road parking for a maximum of 5 cars, situated within 100 yards of the beach and promenade. 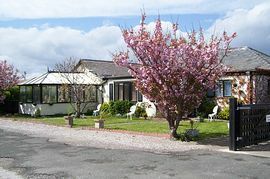 The bungalow has 5 bedrooms with wide door access all bedrooms are en suite. Two of which have alternative provision for twin beds. One bedroom has a walk in shower with wheelchair access. There is also a separate bath/shower room. The hallway contains an air hockey table. There is a conservatory and adjoining playroom, which contains a full size pool table, children�s toys are provided. 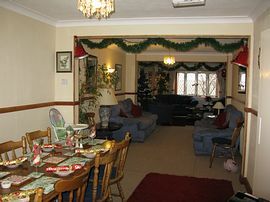 There is a very large lounge, a dining area, which can seat 12 persons and a good size kitchen. 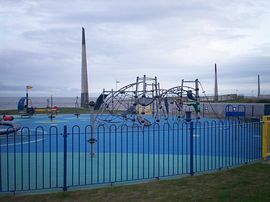 The secure rear garden has a children�s swing and slide. There are local shops, supermarket, Post Office, Doctors surgery, two pubs and restaurants, one with children's soft play area, all within 600 yards of the property. An ideal property for children and large family groups. Located in an ideal base for touring the sights and attractions of North Wales. Wheelchair access to shower in large front bedroom. Very close to beach,promenade and harbour. walk-in shower.wide doors.All ground floor. Turn off at Abergele roundabout to Towyn and Rhyl. Before the Foryd Bridge(blue bridge over the Rhyl Harbour),turn left down by the left side of the Mayquay Pub and Restaurant, at the end of the cul de sac there is a black gate with the name Beach Bungalow on it. Pull into the car park. Some seasonal special offers please contact owner. 2 day breaks available Ideal for your celebrations. "An ideal place to stay with a large family so much room, well worth another visit." August 2008. 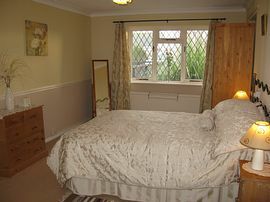 "A very well equiped property we have had a lovely time."